Looking for the Bordered Version? Click Here. See my full reviews on Etsy here. 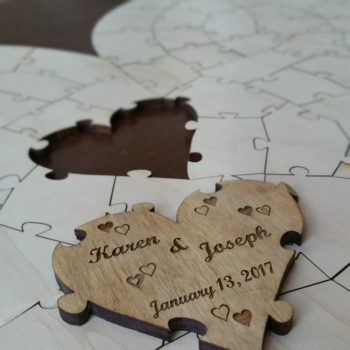 This personalized tree puzzle guest book alternative is a unique, thoughtful and exciting way to involve guests at any event. Whether it’s a wedding, baby shower, birthday, bar/bat mitzvah, fundraiser or any other event, the guests will love being involved in the day being recorded for a lifetime. Frame it and hang it on your wall or challenge yourself by putting it back together down the road. These are big puzzles! They all contain large pieces; allowing plenty of space for guests to write on. You can choose between the 25, 50, 75, 100, 150, 200 and 250 piece tree puzzles. 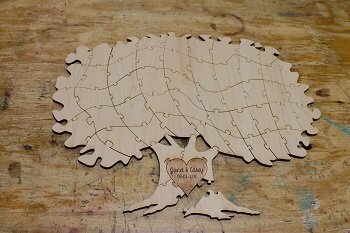 The 25 piece tree puzzle is approximately 15 inches wide and 13 inches tall. 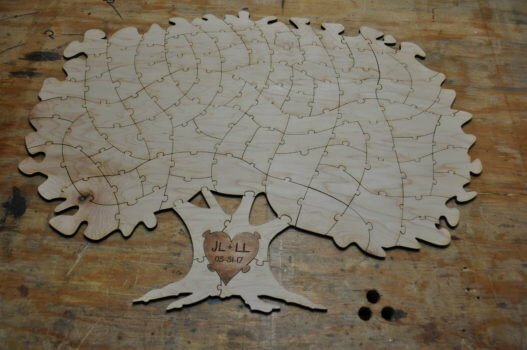 The 50 piece tree puzzle is approximately 18 inches wide and 14 inches tall. 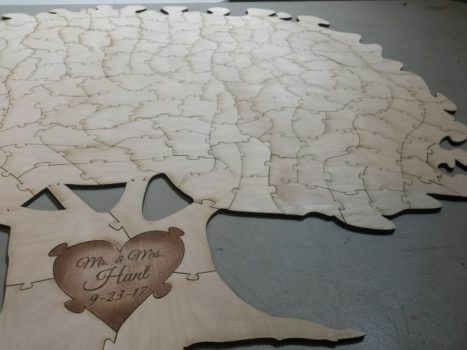 The 75 piece tree puzzle is approximately 21 inches wide and 17 inches tall. The 100 piece tree puzzle is approximately 23 inches wide and 18 inches tall. The 150 piece is approximately 24 inches wide and 23 inches tall. The 200 piece puzzle is approximately 34 inches wide and 26 inches tall. The 250 piece tree puzzle is MAMMOTH!! It’s 43 inches wide and 41 inches tall. Textured Trunk – This is one piece. 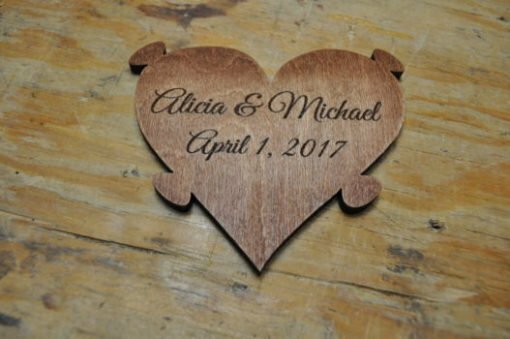 The entire trunk has a dark brown finish, and the area where the text is engraved is a bit lighter. The bark on the trunk is engraved and you can feel the grooves. Original Plain Trunk – The trunk has 4 pieces not including the heart. 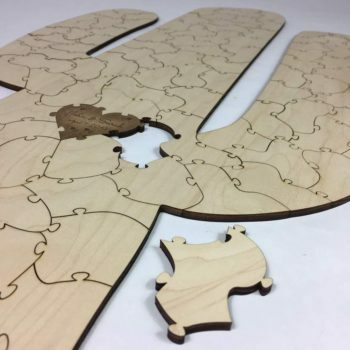 The trunk pieces are plain, allowing writing on them just like the other pieces of the puzzle. The heart has a dark finish which is slightly lightened to allow the text to stand out more. Both trunks have a very light, all natural clear coat added to them. **There are various Font’s you can choose from for this item. They are included in one of the pictures with a letter symbolizing each. If you are on a mobile device, you can scroll through the pictures. Choose which font you prefer upon your order from the drop down list. 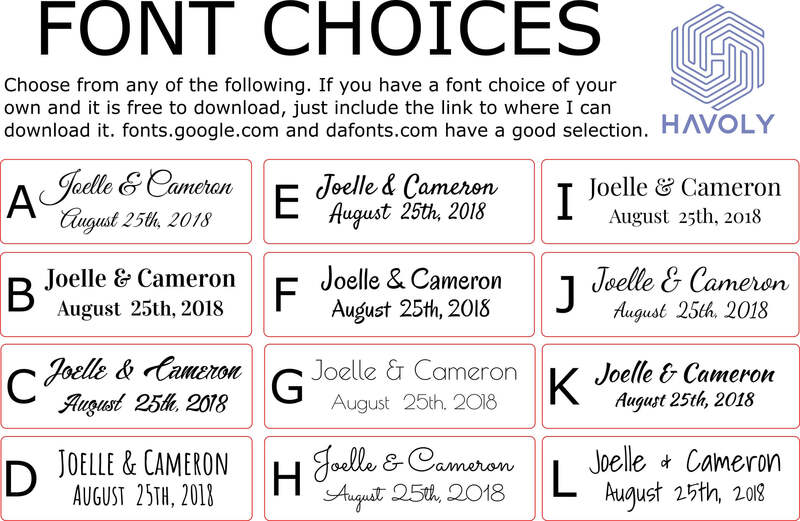 You can also select “Other” if you have your own font in mind and it is free for me to download. Just be sure to leave the link to where I can download it in the notes section during checkout. 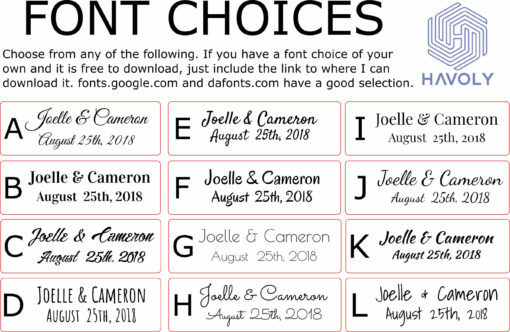 fonts.google.com and dafont.com have a good selection of free fonts. **Make sure to leave a note of exactly what you want engraved. You will find a text area to fill out in the on this product page. 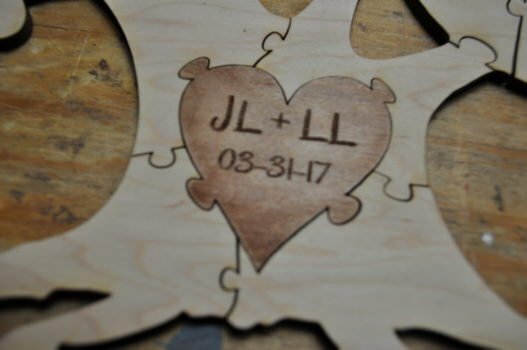 In the case of the main item pictured, this would be “JL + LL” anything written in parenthesis will be considered a symbol or icon; for instance you may want “Tanya (heart) Jason”. You may also choose something like “Mr. & Mrs. Avery 7-10-16” or “Jenny’s birthday party August 5th 2016” Whatever you choose, I can engrave it and I will design it to look as best as possible. All of the puzzles are cut from quality quarter inch maple plywood. Nearly any pen works for writing on them. I suggest a regular bic pen, as this won’t bleed. I have never had an issue with a fine tip marker; A couple of times in the past, people have told me they slightly bled, although I have never experienced it. All wood is different, so test out different pens you like. I include a blank piece of wood to test pens on. 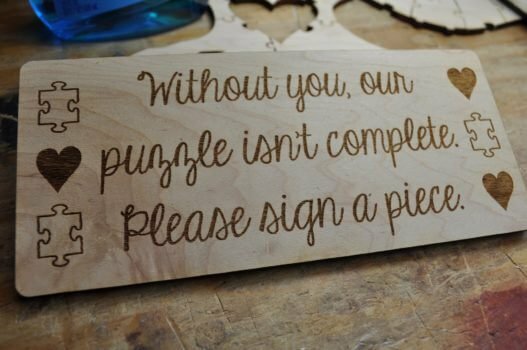 Check out the other puzzles we make. We have an elegant bordered look, and also in a heart shaped. All come in a variety of sizes. 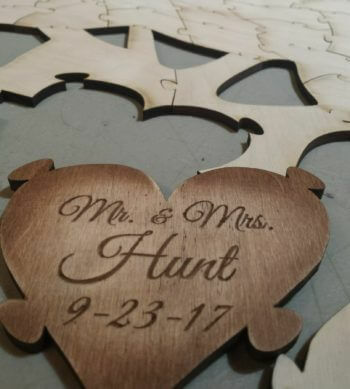 If you want something even bigger than what you find listed here on the website, shoot me a message, We do custom work all the time, so don’t hesitate to ask. 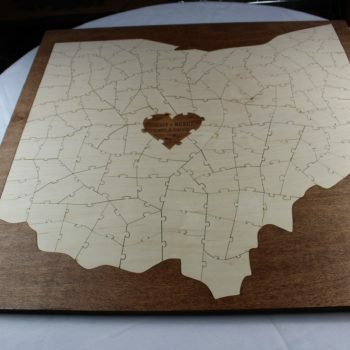 I also sell other event items such as drop top guest books and heart puzzles. Or take a look at all of our unique guest book products. I can also make a custom box for this puzzle. 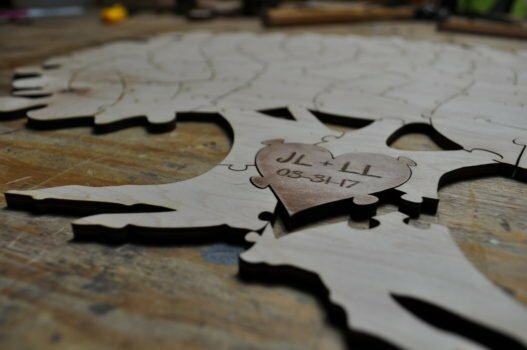 The custom box will also have your names and the date engraved on it, and it holds the center engraved heart on the top, much like a puzzle piece itself. There is an example of this box for a 100 piece puzzle in my shop. The prices will vary depending on the amount of pieces your puzzle is. Ask me about this in your notes if you’re interested. Have an idea for a new puzzle shape? Drop me a message! I’m always trying to create new and exciting stuff. 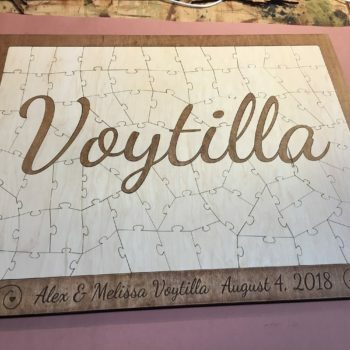 Loved how easy it was to order my guest book puzzle! I look forward to when it arrives in the mail. I can’t wait for all my guests to sign and for my future husband and I to put together this treasure.